← I have a pdf file and who can help me convert it to potm? How to convert PDF file to FAX image easily? The pdf file is very convenient for you to read,to preview,to print and to correct sometimes. But How to convert pdf file to fax image(ClassF Tiff Format) when your friends ,your boss, your workmates or even your business partners have to use fax image format, here is your best choice to solve your problem------PDF To Image Converter v2.1. Step 1. Open PDF To Image Converter v2.1 , you will see there is a button called “Add” , which need you to click it while a window pop out ,select your own folder to choose a PDF file. Step 4. Here my pdf file is consist of 3 pages ,so operate:“Page range”>"To”=”3”(You should set this parameter larger than the most largest number under “Page Count” title). Or you can get the range pages via setting “From” and “To” to 2 and 3 if you just want to convert the pages of your pdf on 2-3 page. Step 6. 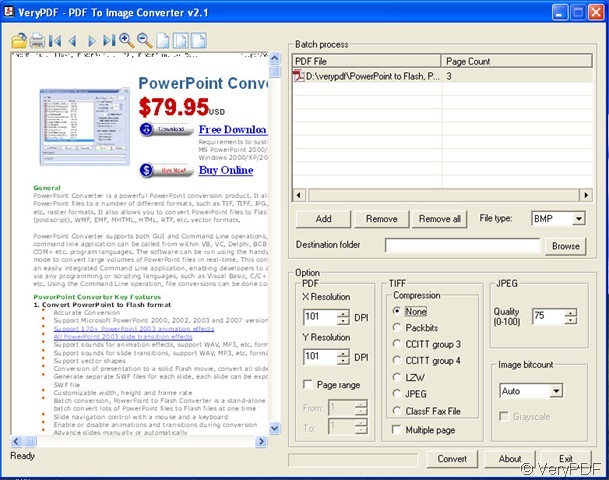 By now ,you can get your fax image from this kind of processing of how to convert pdf file to fax image in PDF To Image Converter v2.1, at last, you can close PDF to Image Converter . How do you get PDF to open without the Acrobat Reader toolbars etc showing? How to get a bigger dimension tga through converting pdf to tga? 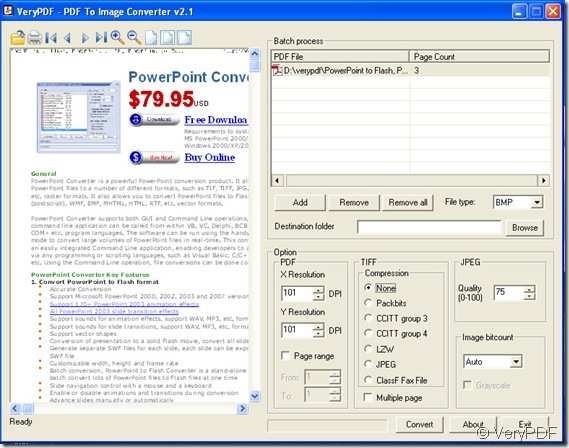 How to convert French PDF to image with PDF to Image Converter? Who can offer us with a converter? how to convert pdf file to wmf image in it, please? This entry was posted in PDF to Image Converter and tagged pdf, Tiff. Bookmark the permalink.